The Dow Jones Industrials were looking good early in the day, but energy stocks sabotaged a solid performance. The Dow Jones Industrials (DJINDICES:^DJI) went from riches to rags Tuesday, closing with a loss of 119 points on the day. The Dow initially started off the day by climbing into prospective record territory on positive economic data reports. Yet even though investors temporarily cheered better consumer confidence and a healthy housing market, energy stocks ended up leading the charge downward in the afternoon hours, and ExxonMobil (NYSE:XOM) ended up leading all losing stocks in the Dow while Chevron (NYSE:CVX) weighed in with less extensive declines. 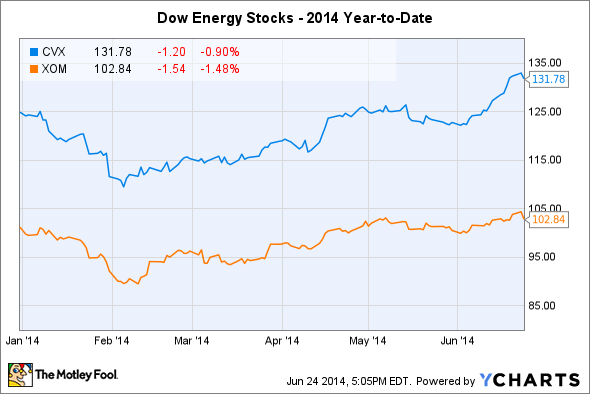 Oil prices weren't the reason the oil stocks in the Dow Jones Industrials gave up ground today. Oil did decline slightly, but West Texas Intermediate remained above the $106 level, and geopolitical tension in the Middle East remains troublesome enough to support oil prices at least pending a longer-term resolution. One factor that's affecting both Chevron and ExxonMobil is the need to pursue international opportunities for growth that open up the companies to potential pitfalls. For instance, ExxonMobil is in talks with Turkish officials about potentially exploring for shale gas, but the nation's proximity to northern Iraq makes it a potentially dangerous place to consider exploration. Meanwhile, in Norway, Exxon could face a strike that would result in the loss of production from some of the energy giant's offshore oil-production platforms. Chevron faces similar challenges with its extensive assets, which range from Australia to the coasts of Africa and South America, and its landmark environmental case against Ecuador show the potential dangers of missteps in foreign jurisdiction -- despite the case's favorable outcome. But looking beyond the oil stocks in the Dow Jones Industrials, you can find much bigger losses among smaller exploration and production companies. That suggests a broader sector rotation out of energy, which is a common tactic that short-term traders use to squeeze out gains from a particular area of the market before moving on to better prospects elsewhere. Looking at the long-term trend among energy stocks, today's move downward barely puts a dent in the extensive upward momentum that the energy sector has built up over the past several months. Chevron and Exxon data by YCharts. Chevron and Exxon have risen 15% to 20% since February's lows, reflecting the perception of their being value stocks as well as the strength in oil prices during the time period. In that perspective, overreacting to a 1% move downward is a short-sighted analysis of the situation. The Dow Jones Industrials rely greatly on the energy markets, and so the direction that the Dow's energy stocks move in can bring the entire average with them. For now, though, a single day's declines don't justify any sense of panic among long-term investors.